Or how a simple cake became slightly more complicated but also much tastier. It all started last Friday when I decided to bake a simple cake, a classic french Quatre Quart (Four Quarters) which goes something like this: 1) weigh eggs: 2, 3, 4, or more, depending on the desired size of the cake; 2) prepare the same weight in butter, sugar, and flour; 3) mix; 4) bake. It is a practical cake, easy to make anywhere (with a scale). Some recipes call for baking powder, but to me Quatre Quart is a dense cake; when I want something lighter, more akin to Pound Cake, I make Gâteau au Yaourt (Yogurt Cake), another simple formula cake that will find its way into these pages soon enough. Truthfully, I never just make Quatre Quart – it’s not that exciting as is. But it is a good base for baking improvisation. So I lower the amount of sugar, as a matter of habit; I always add fruit; and I often substitute ground nuts for part of the flour. Last Friday I used pears and hazelnuts and went a bit hard on the sugar. That Very Simple Pear and Hazelnut Cake was easily improved with a hint more sugar and some lemon zest, a second version that I made on Tuesday. It was much better though slightly undercooked (a mere technicality) and I was starting to write down the recipe when I thought “toasted hazelnuts.” The added step makes the cake a bit less simple, but well worth it, and no one here complained about having to eat the same cake three times in one week. 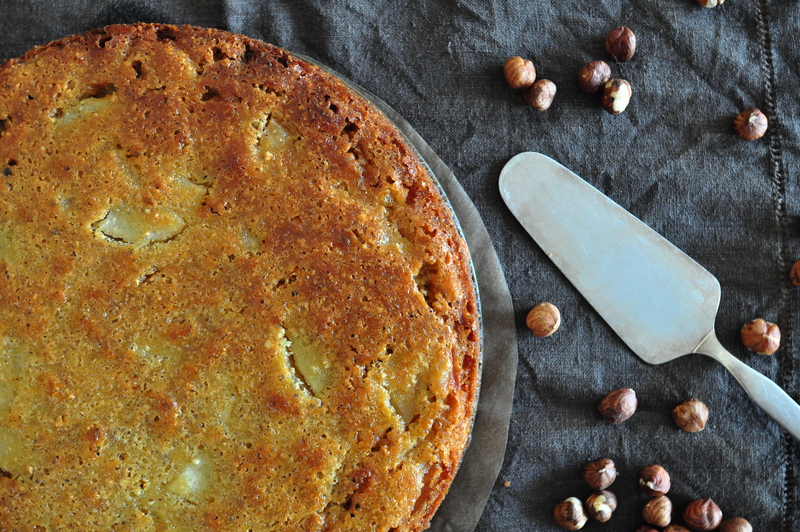 So here it is, Simple Cake with Pear and Hazelnuts – Take 3. 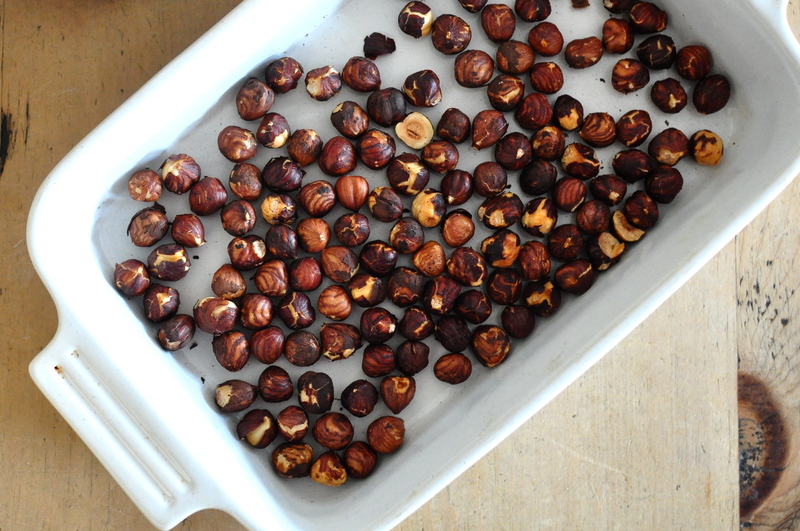 In a roasting tray, toast hazelnuts for about 12 minutes until they begin to darken. As soon as they are cool enough to handle, roughly remove the skins by rubbing the hazelnuts between your hands. Place in a food processor and pulse-chop into a fine flour. Cut butter into small pieces and place in a large bowl to soften at room temperature. Using a wooden spoon, cream the butter with the sugar until smooth. Thoroughly beat in the eggs, one at a time (the dough will be lumpy at this stage), add lemon zest, flour, salt, hazelnuts, and mix well. Peel, core, and cut pears, first into quarters and then into thin slices about 1/8 inch (3 mm). Squeeze lemon juice over the pieces of pear, toss, and gently combine into the batter. Generously butter a 10 inch (25 cm) springform pan. Pour batter inside and smooth surface with a large spoon or spatula. Place pan over a large piece of aluminum foil in the oven for 1 good hour (10 to 15 minutes longer if the pears are very juicy). **Most springform pans leak, the aluminum prevents drops to fall in the oven and burn. ** Test with a knife that should come out clean. As soon as the cake is out of the oven, use a knife to release the cake from the sides of the pan. *I wanted the cake to have lots of pear, but someone pointed out that 5 pears could create too much juice and make the cake soggy. So if the pears are large, or if they are very ripe and juicy, you may want to use fewer. Another option is to toss the pear pieces very lightly with flour before folding into the cake, this will help absorb some of the juice. This entry was posted on 21 January 2011 at 10:03 and is filed under Dessert, Fall, Thanksgiving, Winter. You can follow any responses to this entry through the RSS 2.0 feed. You can skip to the end and leave a response. Pinging is currently not allowed. I love the look of your cake – so homey and rustic. I bet it tastes delicious with all those mellow flavors. I’ve got to try this one. TY. 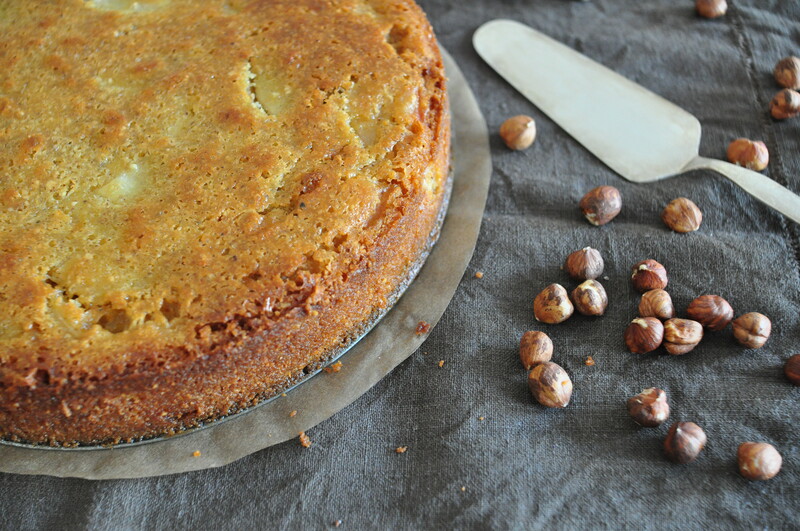 Hazelnuts on a cake, Yummy! I’ve made a similar pear cake before. But with hazelnuts? Yum!!! Well this simple cake turned out wonderfully. I really like this recipe and the pear added to this is a very nice touch. I ate this cake at Valerie’s last night– the perfected third effort, the holy grail of cakes. It was dense, as advertised, and moist too, with subtle hints of citrus (the lemon zest, though I mistook it for orange, because I am not refined). I almost never eat a whole piece of cake, but this one was tasty and before I knew what happened it was gone.